Octocrylene: UV absorber and filter. Absorbs into skin. Produces damaging free radicals upon exposure to sunlight. Octyl Salicytate: UV absorber and filter. Has been linked to contact dermatitus. Bemotrizinol: Absorbs UV rays. Stable when exposed to sunlight. Does not significantly get absorbed into the skin (so is that good news?). It’s not approved for use in the USA, but it is approved in Australia and Europe. Phenylbenzimidazole Sulfonic Acid: Also known as Ensuizole. Absorbs UVB rays. Rated as a ‘moderate hazard’ citing cancer concerns and cellular level changes. With this in mind it is generally considered to be a safe sunscreen ingredient. Do I want it on my skin? Resounding NO. How about you? Phenylbenzimidazole Sulfonic Acid anyone? I didn’t think so. Titanium Dioxyde: Naturally occurring oxide of titanium. 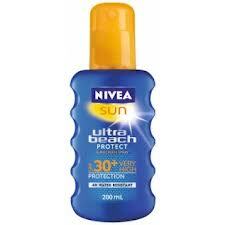 UV absorber. Suspected carcinogen. Polysilicone-15: Absorbs UV light. Considered to be a low overall hazard. Butyl Methoxydibenzoylmethane: Can you even pronounce it? I can’t. It absorbs UV rays. Produces free radicals upon exposure to sunlight. Fab. Oxybenzone: A UV absorber and filter. Petroleum derived. Absorbs through skin. Associated with endocrine disruption (that’s hormone disruption in plain language), produces free radicals upon exposure to sunlight (exactly where you’ll be wearing it), suspected liver and kidney toxicity… and the list goes on. Most sunscreens have oxybenzone. Ethanol: Ethyl alcohol. Anti-bacterial. Solvent. Phenoxyethanol: Fixitive and preservative. Absorbed via the skin. Effects from exposure may include eye irritation, headache, tremors,depression. Can irritate sensitive skin. Suspected reproductive and developmental toxicity. Toxic to kidneys, nervous system and liver. OMG! Hydroxybenzoate: Also known as parabens. Used as an antioxidant and antimicrobial agent. Can cause irritation and contact dermatitis in people with paraben allergies. So what are some safe alternatives? Coconut Oil: Coconut oil has a natural SPF of 8, is extremely hydrating and smells divine. Carrot Seed Oil: Carrot seed oil has a natural SPF of 38. Wow! Raspberry Seed Oil: Raspberry seed oil has the highest SPF of 28-50. Amazing! Wheatgerm Oil: Wheatgerm oil is a very high source of Vitamin E and has an SPF of 20. Hazelnut Oil: Hazelnut oil has an estimated SPF of 10-20. Along with being smart about your sun worship by wearing a hat and covering up if you’re going to spend all day there is no need to use popular sunscreens anymore. Don’t you agree?